Moving into the power era of the present – that of Electricity – we might reflect upon the question – what is a machine? Most would agree that it an assemblage of moveable and non-moveable parts, created to safely and effectively increase the power and/or speed coming out one end relative to that entering, the resultant output having a utilitarian purpose. A toy, however sophisticated, is not a machine. Inventors, engineers, mechanics and manufacturers have ever sought to make machines lighter, smaller, portable, more efficient and less expensive to build and/or operate; and more utilitarian for the needs of the day and a particular era. Early machines were sited where the work was to be accomplished – an irrigation ditch, a river, a windy hill. The transmission belt allowed flowing water, or steam, power to be distributed throughout a factory. Later, underground water pressure lines assured that power could be taken many miles within urban areas. With the coming of the turbine generator, electricity could be distributed with modest expense to many communities with the consequence that lifting equipment could be operated by the newest kind of power. 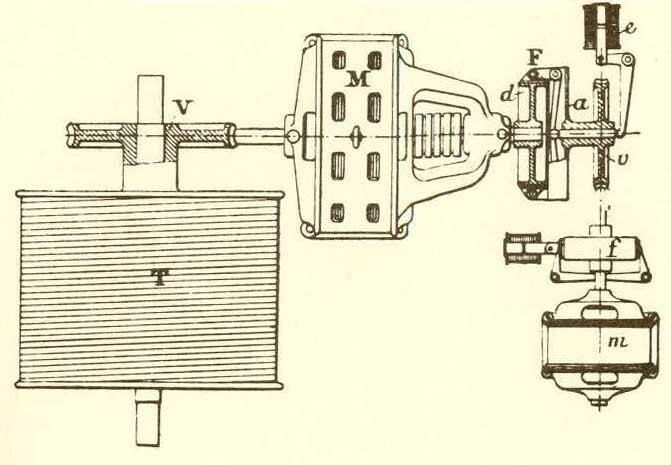 With considerable investment having been made in hydraulic equipment, by both manufacturers and users, it was difficult to wean the latter owners and operators away from such elevating devices; thus many electric motors drove pumps and belts to stand-alone reduction gearing. The distance between gearing and power became increasingly less. How could the transmission of power be eliminated on site and a significant drive package created to tap the far-off generator? As mechanical engineers raced to develop the direct-connected drive machine, the change was being made from the drum to the traction sheave, electrical engineers strove to harness the new power with safety devices – slack cable, limit and interlock switches -- and the development of controllers, associated control devices and fixtures. Electrical power would change drive and control equipment, taking the elevator industry to a new plateau, utilizing banks of cars operating at ever higher speeds in greater comfort. Moreover the network of electric power assured that elevators would be safe and practically servants everywhere!